So your patient complains of an unstable shoulder huh? The joint capsule outer layer composed of avascular white fibrous tissue. Any ligamentous thickenings of the joint capsule (capsular ligaments). The first 5 provide passive stability while the last is mostly active. 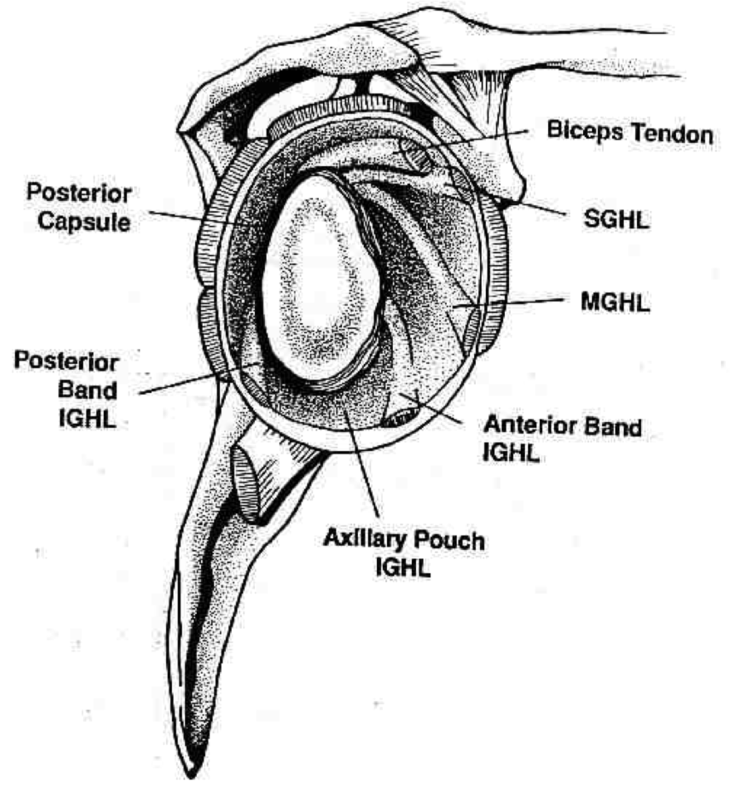 Only 1/3 of your humeral head is in contact with the glenoid fossa at any time, and the GH joint capsule is big enough to even hold 2 humeral heads! Its capsular ligaments only help stabilise the joint at the extremes of ROM. So what holds the humeral head in the majority of the time when we are in/around the neutral position? Passively the synovial fluid, GH fossa and labrum act together like a suction cup. However the main source of stability comes from the tone and activity of the rotator cuff. For part 1: We discuss Muscle Tone and Control followed by Capsular Ligaments, in relation to their role in shoulder stability. So realising that rotator cuff muscle activation is essential to maintain sufficient contact between the humeral head and the glenoid fossa during movement. Seems like it should be an easy job getting a bunch of muscles to contract again right? And to do that we should just strengthen them all, add a little weight, do some reps, build up some tone…and have a happy patient? Unfortunately this is not always the case. Building up the tone will improve stability to a degree, yes. However, we want to also improve dynamic stability. If you know your origins and insertions of the rotator cuff muscles, you can work out that when each contracts, they perform a different action. This is because different muscle fibre directions/angles have different mechanical advantages. So having a base tone in the muscles is great for static stability, but for movement… the nervous system must have what you could call ‘contractile intelligence’. This involves a sensorimotor relationship where muscles are given motoric instruction, based on our movement intension and the sensory feedback (positive or negative). 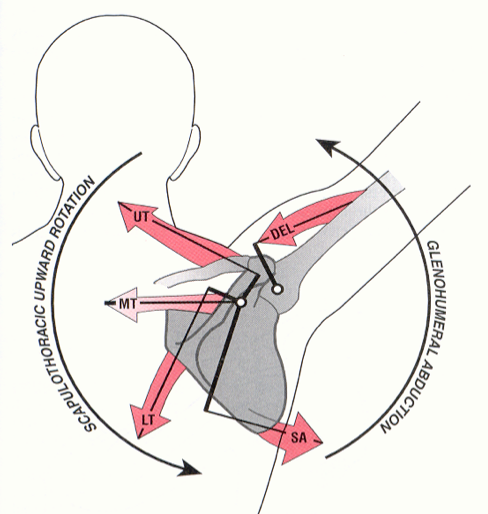 The rotator cuff muscles have to work in synergy for GH stabilisation. This is in an agonist/antagonist relationship involving combined muscular contraction, maintaining compression of the humeral head in the glenoid fossa during active arm movements. Think of how the subscapularis works in opposition to the infraspinatus and teres minor. Also how the deltoid can work against the inferior fibers of these rotator cuff muscles. These ‘force couples’ ensure maximum articulation is maintained, during movement in the desired plane of motion. Picture A shows the myotendinous insertions of the rotator cuff. Picture B shows the tendinous insertions of Supraspinatus (green), Infraspinatus (red), Teres Minor (black) and the Subscapularis anterior to the bicipital groove (blue). (Images from curtis et al 2006). Coordinated muscle activation is essential for dynamic stability. This coordination is built into the nervous system from repetition of movement. When you repeat a movement, virtually the same neurones fire in a chain again and again. There is a saying which goes ‘neurones which fire together, wire together’. This means that repeated movements (with positive feedback) will develop connections to strengthen that neural pathway. Think of it like a walk through a forrest; the more times you walk down a path, the easier it is to follow that pathway again. In the central nervous system this is part of Neuroplasticity. But we will come onto that topic later. Just understand that the body has a unique ability to neurologically store motoric output subconsciously. What order they fire in. How hard they should fire. Discrepancies in either could lead to abnormal articulation… reducing stability in the GH joint. As described further down, the term ‘joint laxity’ is commonly linked to reduced dynamic stability from the rotator cuff. EXAMPLE: What happens when there is insufficient muscle force? Wuelker et al. showed that a 50% decrease in the rotator cuff muscle forces resulted in nearly a 50% increase in anterior displacement of the humeral head in response to external loading at all glenohumeral joint positions. Coordination provides your active stability. Nota Bene (note well): This section on muscle tone and control focuses purely on motoric influence in active stability. But active stability is totally dependent on the quality of the sensory information available! How can your muscles react (subconsciously) if they do not know whats happening? Stability requires healthy proprioception and neuromuscular control. See the section on Sensorimotor Coupling to read more. All this background information is important as when we can understand how active stability works, we can then understand why things go wrong, and what our treatment plan needs to help put things right. So we know now what tissues provide passive stability, what tissues provide active stability… and what information heathy active stability requires. Remember: Active stability requires sufficient muscle force, and of course a healthy nervous system to detect and correctly interpret joint angle and muscle length change. Here is an excellent breakdown of how the shoulder complex operates. This may need reading twice, or more, but I promise you its worth it! Understand: The principle of rehabilitation is to restore function of the dynamic stabilizers proximal, before training the larger muscles which deliver force and power distally. EXAMPLE: Say you have an extremely powerful grip but weak shoulder stability, this means you could hold/crush an apple in your hand by your side, however, would you be able to throw or catch it? As a rule: Stability must begin proximally, to deliver force and power distally. The positioners (deltoid muscle) are soon incorporated into the programme and the propellers (greater pectoral, latissimus muscle of the back) are strengthened last as they are tied to performance (Sørensen et al 2000). The rotator cuff muscles all originate from the scapula – inserting into the greater tubercle (lesser tubercle for the subscapularis). 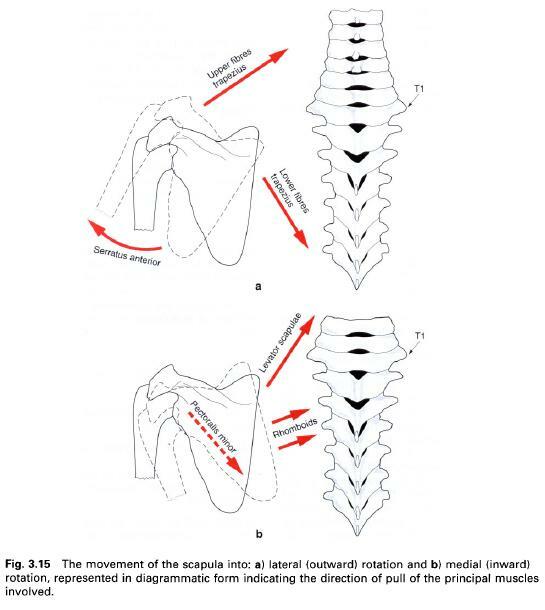 Due to this they are key in the scapulohumeral stability. In rehabilitation; glenohumeral protectors (the four rotator cuff muscles) and the scapular pivoters (anterior serratus) are strengthened first, as they are most intimately involved in providing stability. The positioners (deltoid muscle) are soon incorporated into the programme and the propellers (greater pectoral, latissimus muscle of the back) are strengthened last as they are tied to performance (Sørensen et al 2000). As mentioned in the previous impingement section, hyperangulation can be a causal factor in instability also. The difference being that in impingement the problem was superior hyperangulation… now the problem is anterior (95% of dislocations), posterior and inferior movements (<1% of dislocations). To decrease the risk of hyperangulation, the glenoid cavity must follow the motion of the humerus by coordination of the dynamic stabilizers of the scapulothoracic joint (seratus anterior, trapezius and rhomboid muscles). If you haven’t already, check out my Convex-Concave Rule Explained page. It explains to see how the articular surface of a convex bone such as the humeral head, should slide in the opposite direction of humeral angulation. So if the rotator cuff muscles of the scapula manage the humeral head, who manages the scapula? These are the scapula pivoters. Studies have shown there is a significant association between reduced scapular muscle function, abnormal scapulothoracic motion and patients who present glenohumeral instability or impingement (Warner et al. 1992). 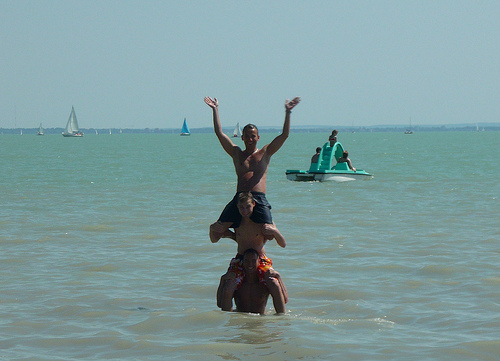 Have a look at this picture… recognise the scapula pivoters working at the bottom? With the rotator cuff unit sitting happily in the middle, supporting the humerus waving on the top? In the same way the rotator cuff unit manages the humerus… the scapula pivoters manage the rotator cuff unit. They work in a chain, and any angular changes distal (on the top), must be controlled by the motor units proximal (at the bottom). Luckily your shoulder girdle has better mechanics than these guys, but you can imagine how any lack of neuromuscular control will affect the whole system. Training techniques and methods to improve neuromuscular control will soon be added in our treatment section. These provide gross, performance related movement. When 1, 2 and 3 above function well… this 4th group then has the stability to deliver force and power through the humerus! Nota Bene: The elbow, wrist and finger joints all work with this same requirement of proximal stability for delivery of force/power distally. Now we look at the passive stability of the joint. Joint Instability and joint Laxity are frequently misused, here is the difference. Instability is a symptom, and usually in one direction only. Laxity is a sign, and is usually multidirectional. Instability– Usually unilateral and in one direction with a structural cause. This can either be when the capsular ligaments/labrum has been damaged by a major injury, or because the capsular ligaments/labral structures are deficient as a result of minor injury or repetitive micro trauma. This is frequently seen in overhead athletes from repetitive movements using capsular end ranges, such as over head throwing. Laxity – Usually bilateral due to muscle tone involvement, and closely related to Multi Directional Instability (MDI). Dynamic control of the rotator cuff (and scapular) stabilisers are widely suggested to be responsible for laxity. As the name ‘laxity’ suggests…relaxation or hypotonia are frequently responsible… so really…this could be in the Motor Tone and Control section! However, if there is a previous history of dislocation or trauma then joint tissues could be distorted/lengthened, and if this was the case then it is a passive instability. Can we have muscle laxity and joint laxity at the same time? Yes! Trauma from muscle laxity often produces joint laxity. Think of patients with recurrent dislocations as an example, also stroke patients, who frequently present with shoulder pain due to prolonged dislocation. Take a look at this picture and notice the various supports including the GlenoHumeral Ligaments (GHL) which prevent movement of the humeral head. Superior support: The supraspinatus (when contracted), long head of the biceps tendon, and coracohumeral ligament (not pictured). Inferior support: Long head of the triceps and coracohumeral ligament. In full GH abduction this also includes the posterior band of the IGHL (in internal rotation), and the anterior band of the IGHL (in external rotation). Posterior support: The infraspinatus and teres minor (when contracted), as well as the posterior capsule (especially in internal rotation). Anterior support: The Superior GHL and Middle GHL (especially in external rotation). Interestingly, Wall and O’Brien found that the Middle GHL is absent in 27% of individuals. It may also present as thin ligamentous tissue, or appear cord-like and as thick as the biceps tendon. As stated previously, the capsular ligaments provide stability in extremes of motion – when stretched and under tension. External rotation of the arm stretches all three ligaments while medial rotation relaxes them….explaining why internal rotated positions hold higher risks for dislocation. Rotator cuff muscles insert into the humeral head, with more inferior fibers inserting into the capsule (Curtis et al 2006). When co-contracted with other (antagonist) muscles they provide compression into the joint, their muscle bellies can also act as additional ‘bands’ of support when contracted and against the humeral head. So your patient comes to you complaining of an ‘unstable shoulder’, ask yourself is this more actively or passively unstable? Is it a unidirectional (and so possibly unilateral) instability or is it multidirectional suggesting a previous history of dislocation/trauma which could produce joint laxity? If it is multidirectional (and possibly bilateral) without previous dislocation/trauma, then maybe its an active instability of the cuff muscles… which is related to hypotone individuals… who in many cases are hypermobile. It could be one of those, it could even be a combination. More details from your evaluation will allow you to tailor your treatment plan better. Giving your patients faster results… and making you the ‘to go to’ physiotherapist! Stay tuned for the second and final part where we will look at Instability with relation to Rotator Cuff and Labrum Tears. To follow the JC Physiotherapy page on Facebook for extra posts click here. This is great post and thank you very much! You say “External rotation of the arm stretches all three ligaments while medial rotation relaxes them (which makes sense)….explaining why internal rotated positions hold higher risks for dislocation.” Regarding that last part – To my knowledge, it is the externally rotated, abducted and extended humerus that is far more vulnerable to anterior displacement? Thanks Greg! Glad you liked it. Any extreme of shoulder ROM (with or without rotations) can hinder GH joint stability. The main reason being that the axial load through the humerus begins to act further away from the centre of the glenoid fossa. The closer towards the edge, the more likely it is to fall out! Its pretty rare for us to load the arm axially during IR, the combination of adduction reduces passive stability further e.g. during weighted cable crossovers. The position of ER + horizontal abduction + extension however is a more functional position, especially when loading up for a throw. As the humeral head rolls back an glides forward, the scapula must/should retract to maintain the axial load as central in the glenoid fossa as possible. Of course, the scapula has its own limitations for retraction, and as the axial load creeps anteriorly during horizontal abduction… the anterior glenoid rim and labrum simply haven’t got the obstructive angle to resist humeral head pressures! And the capsular ligaments provide only a fraction of stability in comparison to these structures. Thanks for the Reply. I do understand. You have a great way of explaining joint kinematics!